A somewhat bearlike mustelid with massive limbs and long, dense, dark brown pelage, paler on the head, with two broad yellowish stripes extending from the shoulders and joining on the rump; bushy tail; relatively large feet; 650-1125 mm total length, 170-260 mm tail, 180-192 mm hind foot; mass 7-32 kg; females average about 10% less than males in linear measurements and 30% less in mass (Hall 1981, Ingles 1965, Nowak 1991). Breeds April-October (but variable), usually in summer. Implantation is delayed generally until winter. Gestation lasts 7-9 months; active gestation 30-40 days. One to six (usually 2-4) young are born January-April, mainly February or March (reportedly April-June in the Pacific states, Ingles 1965). Young are weaned beginning at about 7-8 weeks, separate from the mother in the fall. Sexually mature generally in the second or third year. Males sexually mature sometimes as yearlings (Alaska and Yukon); males over three years old were sexually mature in British Columbia. Some females mature at 12-15 months and produce their first litter when two years old. (Wilson 1982). In some areas, females may produce litters only every 2-3 years. In British Columbia, most mature females were reproductively active. Lives to an age of up to about 10 years, or sometimes 15-18 years or so. Solitary and wide ranging. Occurs at relatively low population densities (e.g., 1 per 65 sq km in one area in Montana). Males in some areas apparently are territorial, but in Montana there was extensive overlap of the ranges of both the same and opposite sexes. Apparently territory/range size depends on availability of denning sites and food supply (see Wilson 1982). Some individuals travel regularly over the same route (Wilson 1982). There are no important predators other than humans. See Whitman et al. (1986). Tends to occupy higher elevations in summer, lower elevations in winter (Hornocker and Hash 1981, Whitman et al. 1986). Male home ranges large: up to 1,000 square kilometers (RIC 1999); averaging 422 square kilometers in Montana (Hornocker and Hash 1981) and 535 square kilometers in Alaska (Whitman et al. 1986). Home ranges of females with young much smaller, ranging from 73 to 416 square kilometers (Hornocker and Hash 1981, Gardner 1985, Magoun 1985, Whitman et al. 1986, Banci 1987, Copeland 1996). Alpine and arctic tundra, boreal and mountain forests (primarily coniferous). Limited to mountains in the south, especially large wilderness areas. Usually in areas with snow on the ground in winter. Riparian areas may be important winter habitat. May disperse through atypical habitat. When inactive, occupies den in cave, rock crevice, under fallen tree, in thicket, or similar site. Terrestrial and may climb trees. Young are born in a den among rocks or tree roots, in hollow log, under fallen tree, or in dense vegetation, including sites under snow. Opportunistic. Feeds on a wide variety of roots, berries, small mammmals, birds' eggs and young, fledglings, and fish (Hatler 1989). May attack moose, caribou, and deer hampered by deep snow. Small and medium size rodents and carrion (especially ungulate carcasses) often make up a large percentage of the diet. Prey are captured by pursuit, ambush, digging out dens (Biosystems Analysis 1989), or climbing into trees. May cache prey in fork of tree branches or under snow. Active throughout the year. Active both day and night but primarily nocturnal. Holarctic; northern Europe, northern Asia, and northern North America (Pasitschniak-Arts and Lariviere 1995, Aubry et al. 2007). The species occupies a wide elevational range; for example, in California, wolverines have been recorded at elevations of 400 to 4,300 meters (average 2425 m) (California DF&G 1990, Wilson 1982). Historical range in North America: arctic islands to the mountains of California, Colorado, and Utah (Predator Conservation Alliance 2001), and parts of the northcentral and northeastern U.S. (where records are sketchy and scarce). Presently extirpated from most of the southern part of the range, including all of the northcentral and northeastern U.S. and most of southeastern and south-central Canada. In Canada, the wolverine retains its original distribution in the arctic region and in the western mountain and boreal regions but has disappeared from the prairies and from areas south of the boreal forest in eastern Canada; within the boreal region a large gap distributional has developed southeast of Hudson Bay (Dauphine, 1989 COSEWIC report). There have been no verified reports of wolverines in Quebec since 1978, or in Labrador since 1950, but there are unconfirmed reports almost every year (Environment Canada, Species at Risk website). Recent surveys in the contiguous United States indicate that wolverines appear to occupy (and are essentially limited to) the montane regions of Idaho, Montana, Wyoming, and Washington (Copeland 1996; Washington Department of Wildlife 1998; Inman et al. 2002; Giddings, pers. comm., 2003 cited by USFWS 2003; Squires, pers. comm., 2003, cited by USFWS 2003). Until recently, there had been no confirmed records of wolverine in California since 1922 (Grinnell et al. 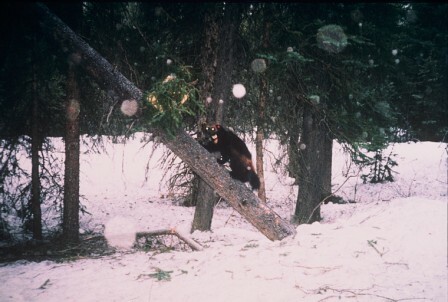 1937); attempts to locate wolverines by means of photographic bait stations during the winters of 1991-1992 and 1992-1993 yielded no records (Barrett et al. 1994). In 2008-2010, a single male wolverine was photographed by camera traps in the central Sierra Nevada of California. However, genetic data indicate that this male is related to wolverines in the northern Rocky Mountains and not a remnant of the native California population. See Predator Conservation Alliance (2001) and Wilson (1982) for a state-by-state review of occurrence in the contiguous United States. Banci, V. 1986. The wolverine in the Yukon: myths and management. Discovery 15:134-137. Elliot. 1904. Field Columbian Museum, Publ. 87, Zool. Ser. 3:260-261. Gardner, C. L., W. B. Ballard and R. H. Jessup. 1986. Long distance movements by an adult wolverine. J. Mammal. 67:603. Halfpenny, J.C., et al. 1979. A bibliography of mustelids. Part IV: Wolverine. Michigan State Univ., Agric. Exp. Sta., Jour. Art. No. 9214, 121 pp. Hash, H. S. 1987. Wolverine. Pp. 574-585 in: M. Novak, J. Baker, M. Obbard and B. Malloch (eds). Wild furbearer management in North America. Ministry Nat. Res., Ontario. Hatler, D. F. 1989. A wolverine management strategy for British Columbia. British Col. Ministry of Environment, Victoria, Wildl. Bull. B-60. 124 pp. Hornocker, M. G. and H. S. Hash. 1981. Ecology of the wolverine in northwestern Montana. Can. J. Zool. 59:1286-1301. Johnson, R. E. 1977. An historical analysis of wolverine abundance and distribution in Washington. Murrelet 58:13-16. Magoun, A. J. 1987. Summer and winter diets of wolverines, GULO GULO, in arctic Alaska. Canadian Field-Nat. 101:392-397. McKay, R. 1991. Biological assessment and inventory plan for the wolverine (GULO GULO) in the Uinta Mountains. Utah Nat. Res., Salt Lake City. 58 pp. Pasitschniak-Arts, M., and S. Lariviere. 1995. GULO GULO. Mammalian Species (499):1-10. Sargeant, A. B. and D. W. Warner. 1972. Movements and denning habits of a badger. Journal of Mammalogy 53:207-210.
van Zyll de Jong, C.G. 1975. The distribution and abundance of the wolverine (Gulo gulo) in Canada. Canadian Field-Nat.,89(4):431-437. Whitman, J. S., W. B. Ballard, and C. L. Gardner. 1986. Home range and habitat use by wolverines in southcentral Alaska. Journal of Wildlife Management 50:460-463. Wilson, D. E. 1982. Wolverine GULO GULO. Pages 644-652 in J. A. Chapman and G. A. Feldhamer, editors. Wild mammals of North America: biology, management, and economics. Johns Hopkins Univ. Press, Baltimore. 1147 pp. B.C. Conservation Data Centre. 2005. Species Summary: Gulo gulo. B.C. Minist. of Environment. Available: http://a100.gov.bc.ca/pub/eswp/ (accessed Apr 25, 2019).